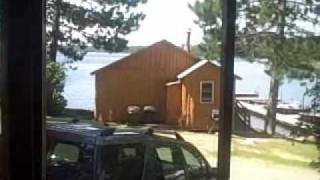 The Minnesota lake cabins of White Iron Beach Resort have fully equipped kitchens with light housekeeping available. Cabin 10 is steps away from the resort’s swimming area with sandy beach, lounge chairs, and giant fire-ring for group campfires at night. This original log White Iron Lake cabin built in 1917 has been updated with a modern interior and is one of resort’s largest one bedroom/one bathroom units. You will enjoy relaxing in the screened porch near the lake’s edge and listening to the calls of wildlife of the surrounding woods.The natural knotty pine interior of this Minnesota cottage creates that rustic Northwoods feel of truly being in one of the most untouched areas of the United States near the Canadian border. The kitchen has a refrigerator, stove, toaster, microwave, coffee-maker, silverware, dishes, and cookware. Bed linens are included, but guests need to bring their own bath and dish towels. This northern Minnesota vacation home in Ely, MN offers a beautiful lake to fish and explore plus access to the Boundary Waters Canoe Area Wilderness. You’ll love the pristine water, great fishing, family recreation, and the breathtaking views. Sleeping arrangements: Bedroom 1 - full bed; futon in living area. Cabin 10 is a year-round rental with gas or electric heat to keep you comfortable in any season. Your rental includes the complimentary use of resort facilities and amenities, including kayaks, canoes, basketball and volleyball courts, playground, organized game nights, a clean sandy beach, boat ramp, sauna, and campfire pits. White Iron Lake is part of a five-lake chain that extends into the Boundary Waters Canoe Area Wilderness - a paddler’s paradise with unforgettable scenery, dense forests, islands, rocky shorelines, and abundant wildlife. We can even issue you a Boundary Waters Canoe Area Wilderness (BWCAW) permit and outfit you for an overnight camping trip. You have so much to do right at the resort - swimming, fishing, boating. Use the sauna and check out our game room, playground, and volleyball and basketball court. Bring your own boat to launch at the resort boat ramp or rent one of ours. 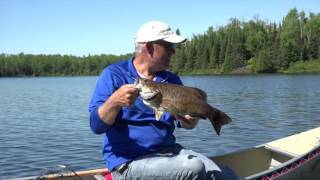 This Minnesota chain of lakes is known for great walleye, crappie, bass, and northern pike fishing. Our resort has a fishing cleaning station to prepare your daily catches. Take the short drive into Ely for unique shopping, entertainment, dining, and special events. There are numerous hiking and biking trails in the area, or maybe you want to take a tour of the Tower-Soudan Underground Mine. At the end of the day, you’ll have a great time gathering on the beach for a campfire and maybe even roasting a marshmallow or two during our weekly marshmallow roast. We specialize in fun for the entire family. Weekly rentals run from Saturday to Saturday. Check-in is available starting at 3:00 pm with check-out scheduled for 9:00 am. A deposit of 30 percent of the rental fee or $300.00 (whichever is greater) is required to reserve the cabin. No smoking. See website for Boat Rental rates.